This is the fourth and final installment looking back on the Boston-Haifa Connection’s inaugural Hatikvah Mission, written by Ken Kaplan. 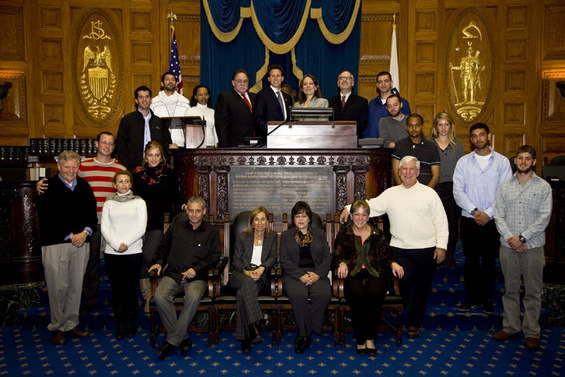 After meeting thousands of people at dozens of venues, the last stop on the officers’ trail was atop Beacon Hill, where the full team of soldiers, accompanied by Shrage, Israeli Consul General Nadav Tamir, and others, were hosted by members of the Massachusetts Legislature in the Members Lounge, a plush, richly decorated room with soaring ceilings. It was very much the culmination of the mission, giving the officers, seasoned by a week of speaking engagements, the opportunity to present themselves eloquently to the gathered politicians. 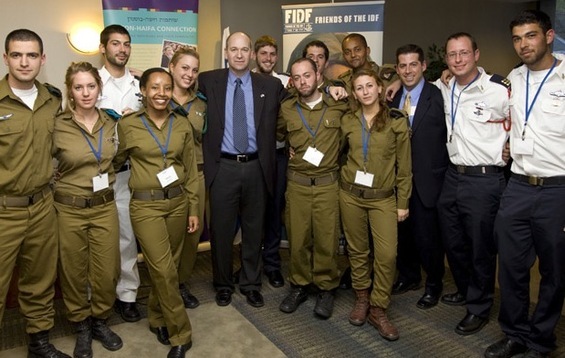 As important for the soldiers, the meeting served as a final, powerful, and convincing affirmation of the warmth and support that Israel still enjoys even outside the Jewish community. Nancy Kaufman, executive director of the Jewish Community Relations Council, made the introductions, noting the special bond the community has with Haifa and mentioning the two main JCRC programs in Haifa: the Shiluvim program to promote the integration of Ethiopian immigrants into Israeli society, and the Learning Exchange, which fosters professional growth for members of NGOs dedicated to social justice and civil society in Boston and Haifa. Also in attendance were Rep. Frank Smizik of Brookline, Rep. Louis Kafka of Sharon, Rep. Lori Ehrlich of Marblehead, Rep. Barbara L’Italien of Andover, Rep. Carolyn Dykema, of Holliston, Rep. Paul Kujawski from Webster, and Rep. Angelo Scaccia of Hyde Park, a Marine Corps veteran of the Vietnam War. After the officers introduced themselves, Adam Hoffman and Aklile Kebede addressed the legislators. Both chose to elaborate on the value they found in visiting the Hyde Square Task Force in Jamaica Plain, a grassroots neighborhood organization that is a participant in the Learning Exchange. “For me personally,” Hoffman said, “it was one of the most important and more meaningful experiences, meeting people who are not Jewish, who don’t come from the mainstream, in our eyes, of society, people who might have a hard time getting on. It put things into perspective for us. As the meeting broke up, with the soldiers heading for a tour of the historic House chamber, Angelo Scaccia had final words of effusive praise to the young officers that evoked the closeness and common purpose the United States and Israel have shared at the heights of their relationship. It was a strong message to leave the soldiers with, a vote of confidence aimed at inspiring rededication. The warmth of the State House reception and the surging confidence exuded by the officers at the close of their mission were quickly seized on as indications that even more could be achieved by future delegations. Ruth Kaplan, CJP’s director of the Boston-Haifa Connection, said that as the wheels are set in motion for another officers mission next year, this year’s successes are translating into proposals to reach out more to non-Jewish Bostonians. “The reception we got from places such as the Hyde Square Task Force and the Massachusetts Legislature was warm and meaningful and went a long way to impress upon the Israelis that they are not alone in the world — indeed they have many friends in America, both Jewish and non-Jewish,” Kaplan said. Reflecting on the mission’s varied successes, Kaplan emphasized the impact it had on younger Jewish Bostonians. “I cannot tell you how many of the children and young adults whom the officers met were impressed by the fact that these heroic and proud defenders of the Jewish State shared the same interests as they did — they were just normal young adults,’’ she said. Kaplan’s counterpart in Haifa, Vered Israely, returned to the mission’s singular event in her own summation of the trip and its impact. In a travelogue she posted on the Boston-Haifa Connection’s page on Facebook following her return to Israel, Israely wrote movingly of the Holocaust Day ceremony at Faneuil Hall. Her emotions reached a crescendo, she said, when the officers, “representing the human web of Israeli society,” proudly marched in and saluted the Israeli flag for the singing of Hatikva. For Israely, the officers’ historic participation in the ceremony, and the vivid scenes inside and outside Faneuil Hall, were proof that the personal relationships fostered by the Boston-Haifa Connection’s work are profoundly important, and enduring.